On 1 February Belarus will raise tariffs for the transit of Russian oil via pipelines crossing its territory by 6.7 per cent. Transit constitutes an important source of revenue for the country, while control of pipeline routes also gives Minsk a bargaining chip in relations with Moscow. Seeking to expand its transit role, the government has announced plans to double its revenues from transit and transportation services. The ambitious plans aim to partly offset Russia’s increasing tendency to route cargo and passengers around Belarus. In 2016 Belarus earned about BYN3.2bn (more than $1.5bn) from transit and transportation services. That meant a growth of 40.8 per cent from 2015. According to an assessment published by Belarus Segodnya, the main media outlet of the Belarusian government, Minsk received $150m for oil transit, $476m for gas transit, and $879m for transportation services in 2016. The Belarusian government aims to double revenues from transit and transportation services in next 12 years, taking 2016 as the baseline. This conforms with the Concept of Development of the Logistical System of Belarus covering the period through to 2030, which the Belarusian Council of Ministers approved on 28 December. The newly adopted Concept lists among key priorities the development of transit between Europe and China (including as part of China’s “One Belt, One Road initiative”), integration with EU markets, facilitation of logistical integration between the EU and the Eurasian Economic Union (EAEU), as well as integration with global logical and transport companies. Is it realistic? Belarus’s transit role in various sectors has grown in recent years. Transit flows increased after the start of the conflict in Eastern Ukraine, as Kyiv minimised its rail transportation with Russia. On 12 December, Ukraine’s minister for infrastructure, Volodymyr Omelyan, announced that plans to completely halt rail transport to Russia are under consideration. If realised, this would mean that even more passengers and cargo between Ukraine and Russia would cross Belarus. the main transit flow for Belavia and the National Airport Minsk is that one between Ukraine and Russia. I think this is about half of the total transit flow. That’s why we began to fly more [frequently] to Ukrainian airports. The visa-free regime that Minsk introduced for citizens of eighty countries in February 2017 also facilitates passenger transit through Belarus. The probable increase in the duration of the visa-free regime, recently discussed by foreign minister Uladzimir Makei, can be expected to further promote transit. At the same time, a series of growing problems seriously undermines these transit developments for Belarus. Most acutely, other developments threaten gas transit – more profitable and politically crucial than oil transit. Despite the efforts of Russia’s opponents, especially Poland and Ukraine, Moscow continues to lay additional pipelines as part of the Nord Stream project. The pipeline brings gas from Russia to Germany via the Baltic sea, circumventing Belarus and other Eastern European countries. 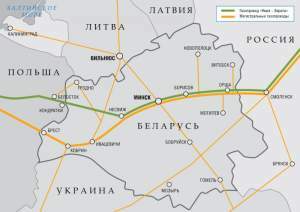 As early as January 2007, Belarus’s president, Alexander Lukashenka, called the plans for Nord Stream “Russia’s most foolish project.” His consternation hardly surprises, Minsk traditionally collects not only transit fees from Russian gas exports but also uses its capacities to regulate these transit flows as a leverage in political disputes with the Kremlin. Minsk may lose more than gas transit. In September, the Moscow-based Kommersant daily newspaper reported that Russian shipbuilding firms were beginning to construct huge railway ferries to connect mainland Russia with the Kaliningrad enclave. If implemented, this move will relieve Russia of dependency on the region’s countries, including Belarus, in its land communication with Kaliningrad enclave. Integration with Russia and members of Russia-led EAEU very little helps Belarus to attract transit flows. Russia’s effective closing of almost the entire border with Belarus for nationals of third countries in October 2016 dramatically illustrated this, as did the introduction of border control zones in February 2017. Wider Eurasian integration has brought even fewer results in the sphere of transit and transportation. The head of managing board of Eurasian development bank, Dmitri Pankin, admitted this at the 12th International conference on Eurasian integration in Moscow in October. He stated that analysis of 30 major projects between EAEU member countries in the transportation sphere revealed a comprehensive lack of coordination. Bogies exchange operation necessitated by the difference in the track gauge of Belarusian and Polish railways. Image: Nikozhmegov, Wikipedia. 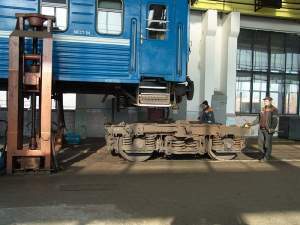 The different width of railway track gauge between the former USSR and countries to the west of them constitutes part of the problem, requiring Belarus to change train undercarriages on the border. Moreover, according to Pankin, while Chinese containers move on Belarusian and Russian railways at a speed 40−50 km/h, after they cross Polish border their speed falls to just 15 km/h and the trains have to be shortened due to different transportation standards. Minsk looks to solve these issues: after all, it has long desired to become a mediator between the Eurasian and European integration blocks. At a meeting of foreign ministers for Eastern Partnership and Visegrád Group members in Warsaw on 12 April 2017, Belarusian foreign minister Makei emphasised the importance of achieving better interaction between the members of both groups on transportation. According to him, this could be achieved in particular by ensuring better compatibility of standards in the region and ensuring international financing for infrastructural projects in Eastern Europe. Yet so far, no material results have followed from these discussions. In recent years, Minsk earned more from transit and transportation services, in particular, due to the traffic of passengers and cargo which had earlier circulated directly between Ukraine and Russia. However, the situation with transit looks precarious for Minsk: Moscow works to decrease major gas transit flows via Belarus, establishing links to the Kaliningrad enclave that bypass Belarus, and otherwise sidelining Minsk and the entire region in its communications links to European countries. The losses for Minsk from these Kremlin policies will be considerable both economically and politically. The Belarusian government apparently wants to compensate by providing Belarusian transit routes for new passenger and cargo flows’ between regional countries, the EU and China. And, last but not least, Moscow’s attitude will inexorably further alienate Minsk from the Kremlin. On Thursday, Lithuania announced that its Klaipeda port had recorded the highest ever annual volume of shipments. This occurred thanks to Belarusian firms’ growing use of Klaipeda despite Moscow’s pressure which demands of Belarus to boycott the Baltic states’ ports. Officially, the Belarusian government and businesses report that they start exporting oil products via Russian ports. Yet, while Minsk tells what Moscow it likes to hear, it continues with business as usual. Minsk giving in to Moscow? On 20 December, Belarus’s Deputy Prime Minister Uladzimir Syamashka “forecast” that in 2018 Belarus would export up to one million tons of oil products via Russian ports. These exports would be rerouted away from Baltic states’ ports. Indeed, on 8 December, Ihar Lyashenka the head of Belnaftakhim (BNK), a Belarusian state company that sells oil products, announced that his firm was beginning to export oil products via Russian ports. The first deal on 72,000 tons should have been finalised in December-January. The formal character of his statement was underlined by the fact that his comments were made at the meeting of the Council of Ministers of the Union state of Belarus and Russia. The actual volume of the deal is negligible, and even the plans to export one million tons a year via Russia fail to impress. For comparison, last year – even after its respective exports had shrunk by about 15 percent – Belarus exported almost a million tons of oil products each month. There is another interesting detail: Russia lacks the technical capacity to reroute even half of these export volumes. 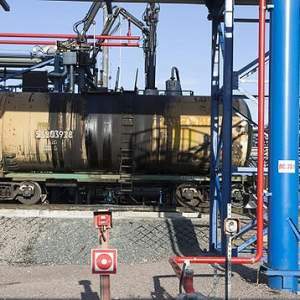 The director of commercial issues for the Russian railways, Aleksei Shilo, told TASS news agency on 19 October that his firm can transport about five million tons of Belarusian oil products per year. The Kremlin’s campaign to impose a blockade on Baltic ports is stalling. Last August, Russian president Putin personally demanded that the transit of Belarusian oil products be rerouted away from the Baltic states to Russian ports. He suggested that this could be done by imposing such logistical demands on Minsk through supply contracts for Russian oil deliveries to Belarus. Previously, beginning in 2016, Moscow had attempted to achieve the same goal by offering Belarus ever bigger discounts on transportation of their export cargo via railways. These efforts failed. Belarus’s Deputy Prime Minister Uladzimir Syamashka told the media that Minsk had signed all oil contracts with Russia for the period until 2025, and that they cannot be amended. At the end of September, however, the acting director of the Belarusian oil company BNK, Siarhei Hryb, announced that Belarus was ready to ship its oil products to foreign customers via Russian ports if it were not for lack of economic feasibility. As TUT.by reported, transhipment operations for one ton of oil products via Baltic states’ ports costs six to eight US dollars, while using Russian ports as suggested by the Kremlin pushes the cost to $12-18. Minsk may have its own reasons to send some cargo via Russia to make a point in relations with its Baltic neighbours. Belorusy i rynok, the economic daily newspaper, observed that Minsk’s decision to export some products via Russian ports could have not only economic but also political reasons. After all, Lithuania objects to Belarus’s nuclear power plant construction project and works to put pressure on Minsk everywhere. Belarusian presence at Lithuania’s Klaipeda port provides Minsk with some leverage over Vilnius. Indeed, although for some years Russia has been reducing the volume of cargo it transports via the Baltic states, Klaipeda thrives. Thanks mostly to Belarusian exports of potash and oil products in 2016 its port achieved a record level of cargo transhipment – 40.14 million tons, and in 2017 it broke that record again by transporting more than 43 million tons. 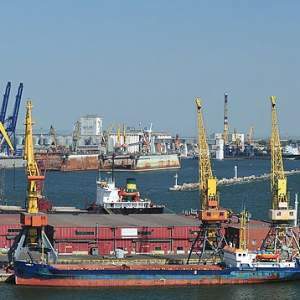 The official share of Belarusian cargo in the Klaipeda port, according to Belarus’s ambassador to Vilnius, Alyaksandr Karol, constantly exceeded 30 percent during the past five years. According to other estimates, in particular those published by the Russian news agency Regnum, the share of the cargo linked to Belarusian firms and shipped via Klaipeda might reach 70 percent. On 5 November, analysing Moscow’s attempts to lure and drive Belarusian firms away from the Baltic states’ ports, the popular Belarusian independent internet portal, TUT.by, interpreted these moves as part of a broader Kremlin reaction to Belarus’s growing presence in Lithuanian and Latvian ports. It started with Belaruskali, the national potash company, buying a 30-percent share in a terminal of Klaipeda port in 2013. The firm has kept this ownership share and invested further. Last September, Belaruskali‘s director Ivan Halavaty announced that Belaruskali could now export all products it needed to ship by sea via its own Klaipeda terminal. Another attempt to improve access to the sea for Belarusian businesses can be seen in Belarusian oil company BNK’s decision to work with the Latvian port in Riga. 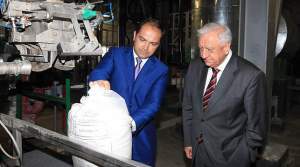 Yet in 2016, Naftan, the Belarusian oil refinery, signed a contract with BNK to export annually in 2018−2022 of at least one million tons of petroleum distillates via the facilities of the Latvian WT OIL Terminal. Both the Belarusian and Latvian firms involved in the deal kept silent about it, though the information was revealed in one of Naftan‘s annual reports. Minsk’s efforts to find alternative options for access to the sea via Ukraine and Poland stalled although the reasons remain unclear. On 4 January, the Belarusian government decided to close its consulate in the Ukrainian port city of Odesa. The consulate, opened in March 2011, coincided with Minsk’s efforts to find alternative sources of oil import and decrease dependence on Russia which relied on the use of the port in Odesa. 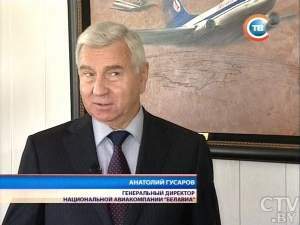 Ironically, it was on his way to a meeting with his Ukrainian counterpart, Pavlo Klimkin, in Odesa in August 2015 that Belarusian foreign minister Uladzimir Makey announced Minsk’s interest in increasing shipments of Belarusian cargo via Ukranian ports. In a related development, on 18 January, foreign minister Makey revealed Minsk’s plans to close its consulate in the Polish port city of Gdansk. In recent years the Belarusian government has studied the opportunities for using Gdansk port and also by developing an international route via rivers between Black and Baltic seas. Hence, land-locked Belarus is struggling not only with the Kremlin’s plans to starve Russia’s regional opponents into bankruptcy. There are problems in Belarus’s relations with regional countries which have nothing to do with Russia. As a result, Minsk shelves, for now, its plans concerning Ukrainian and Polish ports, while its cooperation with Latvia and Lithuania on gaining access to sea suffers from instability. Without stable regional cooperation, Belarusian sovereignty remains under threat. It needs diversified trade and communications which can change the political economy of the Belarusian state and balance Minsk’s dependencies on Russia. This will only be possible if Belarus can secure access to the sea via various countries other than Russia.